As human beings, we have an amazing gift – the ability to be conscious of our own thinking. How are you taking advantage of this gift? When we are unaware of the thoughts running through our head, we are relinquishing control of our mind to the old habits and patterns that we have created in our lives and letting ourselves run on autopilot. 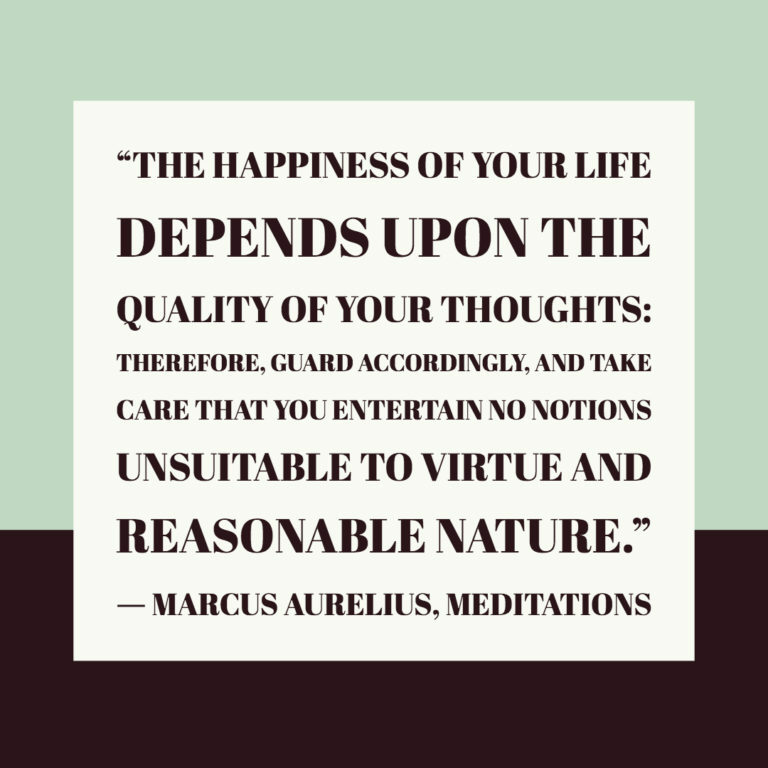 Marcus Aurelius is teaching us here that when we spend our time on thoughts that don’t help us on our path to virtue, we are making ourselves unhappy. The stoics remind us over and over that we are in control of the thoughts we entertain and those thoughts lead to our choices, which lead to the outcomes of our lives. From the moment we wake till the time we fall asleep, our minds are constantly churning through thoughts. Much of this thinking is just everyday thoughts to get through the day such as what to have for breakfast or what clothes to wear. Some are more life-changing such as whether to ask out that person we’re interested in, or what career options to pursue. But many of the thoughts we have are ones that go partly or even completely unnoticed, just buzzing in the background. Maybe we’re annoyed by a snarky comment from our partner earlier in the day. Maybe we’re worried about something we overheard from our co-workers gossiping. Often, we ruminate on thoughts about things we can’t control, and we don’t even notice it. The thoughts we entertain are a key part of the process of creating the life we want. Our thoughts are what create our emotions around the events and people in our lives. They help create the impetus to action, and better actions lead to better results. When we use our reason, rather than our default reactions, we are able to find patterns of thinking that are not helpful and replace them with better patterns, that helps us to see the world from a more useful perspective. And the reverse is true. When we make judgments and focus on thoughts about how crappy life is, then the kind of life we’re going to create is one of negativity and unhappiness. For example, if I sit and think about how someone has wronged me and they owe me an apology, or if I focus on something that happened that I think is unfair and I wish it would change, I’m focusing on things that I can’t control. I’m painting a picture of the world that is negative and one where I’m powerless. How would using your ability to observe and notice what thoughts you are thinking, change your life? What kind of thought patterns could you change that aren’t serving you? When we slow down and take that time, we can see if the thoughts that we think benefit us, or if they are a hindrance. With more conscious awareness, we can make active choices, rather than simply letting our minds run amok. The first part of gaining some more control over our thinking is to limit distractions. We have so many things distracting us in our lives. We try to multitask at work with dozens of tabs open in our web browsers, and emails filling up our boxes, vying for our attention. We carry around a lethal weapon of mass distraction in our pockets. With our phones connected to everything on the planet at all times, it’s so easy to find ourselves perpetually entertained. How would your life change if, when you have a few minutes to yourself, rather than reaching for your phone you took the time to be bored, and to just sit and think? As an example in my own life, for about two months I was playing a poker game on my phone. At first, it was fun, and a bit exciting as I played against an AI and got the feel for the game and improved my skill. I would get that little burst of dopamine every time I pulled off a great hand or a great bluff. But after a while, I began to notice that I was reaching for my phone and opening the game any time I had a few minutes to spare. Often, those few minutes would turn into 30 or 60 minutes to finish a game. I would play it when my partner was talking to me, giving her less than my full attention. I realized that it was not serving me, so I deleted it off my phone. Strangely, I felt some apprehension in doing so, and while I’m glad I did I noticed throughout the last week that I would reach from my phone and start to scroll to the game when I had some free moments. I would catch myself and instead open a book or just pause and think about how I had become a bit of an addict to that game. When you do begin to notice your thinking, be careful not to judge yourself when you do think negatively. Just notice that it’s a thought you are having and that you have the option of what you want to do with it. You can just decide if that thought is one that serves you or doesn’t, but remember, it’s just a thought. If sitting with your thoughts is hard for you, then sit down and write out your thoughts or, grab your phone start a voice memo and record your thoughts for a few minutes. Don’t worry about writing or saying the “right” things, just get them out as soon as they come into your head so that you can observe them later. Once you have them out of your head, then you can start to see where you might be unconsciously focusing on things that aren’t serving you. You can decide to let them go. You can tell your brain, “I see those thoughts, and it’s okay to let those go.” No judgments, just observation. Learning to improve the quality of your thinking is something that anyone can do. The more you can limit your distractions, slow down and notice your thinking, and use non-judgmental and reasoned thinking to focus on the thoughts that are useful, you clear much of the negative mental chatter. When you can quiet down the noise, you are able to train your mind to create thinking that helps you find inner peace, and stay more focus on the task at hand.